Are those tweeters in the Dash of 97 Intrepid. I need to replace the stereo system in the car because the speakers are blown but I noticed 3 round little 3 inch slotted plastic on the dash. As if there are tweeters there. Is that what it is? If so are they easy to take out because if I'm putting some nice speakers in the interior they might as well be replaced too. Thanks in advance. Yes, they are... and you can carefully remove the black piece of the dash and they are mounted under it. There's 3 of them. Thanks. The middle is probable fake right? Suppose I'd find out but this saves me time in buying new one's. What are they 3"? Just bought the car and every car HAS to have aftermarket sound equipment. Could you confim my suspicions? I believe now that there is 2 3" tweets. 6.5" in the doors and good ol 6X9 in the back. Am I right? If you are using a factory amp, you need 2 ohm speakers, or the system will sound horrible. Atleast in my car the wiring was some pretty good single core copper. I have a EQ amp that runs 40 amps RMS through the stock wiring to the speakers and sounds fine to me. Hmm I was was thinking of getting a 4 channel amp also but where do you tuck one of those? Under the seat? or is there space inside the dash behind the deck? So don't bother with Fosgates? I've never owned any but I thought they were good. 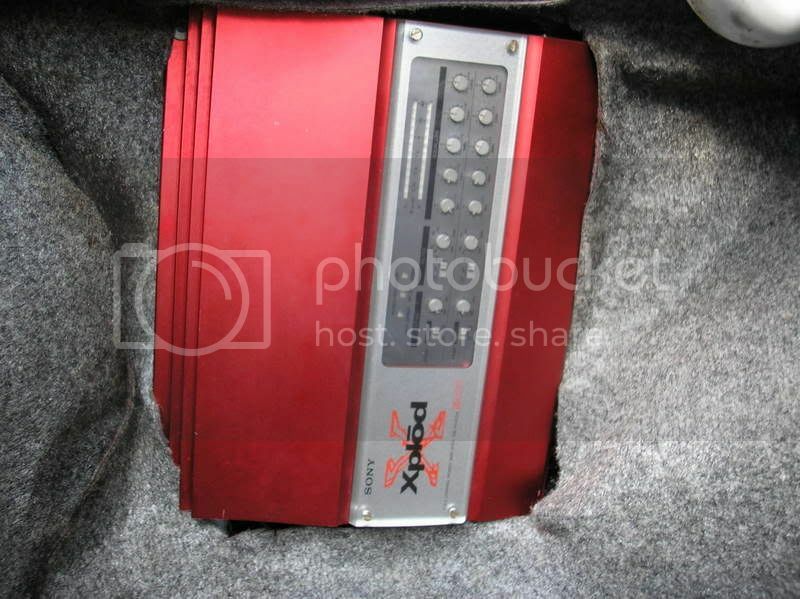 Hey are you saying the factory amp is located in right kick panel? Could I just rip it out and replace with better? I use the factory am location. Driver side Trunk. I have a photo somewhere of mine.. I can get better photo if needed. The wiring is crazy for this seeing I am using the high level inputs and not the RCAs. The curve of the rear tail lamp housing is on then left. Ahhh thank you very much kind sir. Good to know. All the front wire leads go from deck to trunk to speaker then? I got the low-end Rockford's, I mean I got all 4 of them for 85$ off FleaBay. So I imagine they are the low-end line. Factory wires for all speakers can be accessed @ the factory amp locale (Pass. side Kick panel).